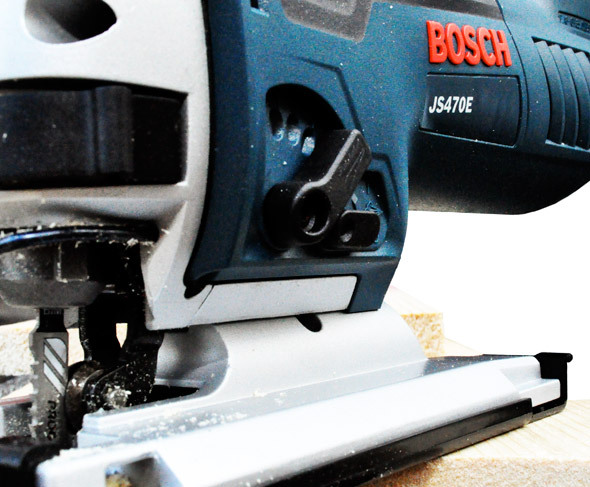 Bosch is known for producing tools of the utmost quality. They have impressive offerings in every category- from drill/drivers to table saws. You can imagine my excitement when they offered to provide the JS470E Top-Handle jig saw for review and I can honestly say this is the best jig saw I’ve ever used. Read on for full details. 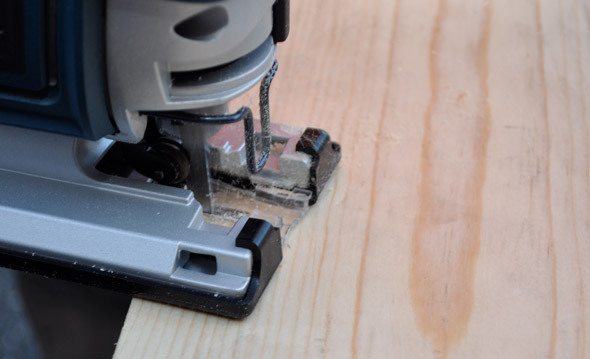 There’s a lot to like about this jig saw. I was impressed with the ergonomics, the cutting and all the extras Bosch included. This jig saw is sweet! The Good: Precision cutting; great control; minimal vibrations; keyless blade change. The Bad: Allen key required for bevel adjustments. Overall: A first-class tool that you will love! Most jig saws today feature a top-handle or barrel grip design. I prefer the top-handle as it feels more secure. The molded grip was comfortable, and the trigger and ambidextrous lock-on button are well placed. This jig saw weighs just under 6 lbs. making it easy to maneuver without fatiguing your arm; a nice improvement over the previous model. Cutting was extremely smooth with almost no vibration. Bosch included a variable speed dial that allows you to adjust the maximum speed and a variable trigger to control operating speed. These features combined give you the ultimate in blade control. The first picture gives you an up-close view of the orbital switch that allows you to adjust the blade stroke. More aggressive cuts are quicker while smooth cuts result in a nice, clean edge. The picture above shows the difference. Using the Allen Key housed in the base, you can adjust the bevel angle between 0° and 45°. It’s stored right by the bevel adjust. It takes about 5 seconds to change the blade. Pushing the front lever ejects the blade saving your fingers from touching a hot blade. Insert another t-shank blade and you’re back to work. I found the blade-clamp to be very secure. Here are a few more features worth mentioning. The adjustable dust blower keeps cutting line clear. Bosch included a generous length- always a good thing. The 7 amp motor is very powerful. What do you think? 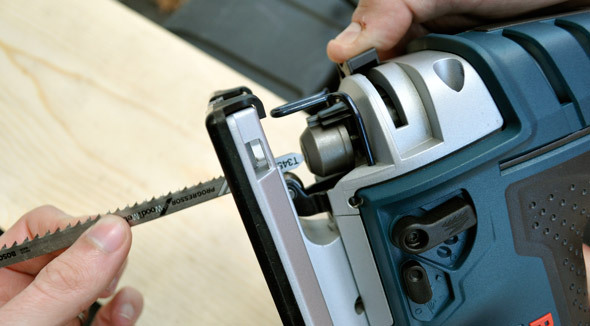 What’s your experience with Bosch jig saws? This would’ve been nice to have while we were building our bookcases. We used an old Black and Decker jigsaw, we were lucky the shleves came out as straight as they did, considering! Hey Sara! Not only does this make straight cuts but smooth ones too. That’s important for any visible edges. Always glad to have your comments. I think this is a great saw, I’ve had an older version for 15 years and it’s still a great saw. We have operators that use this saw for cutting molds out of 45# core (particle board). The complaint is that blades snap and fall out. No visual damage to unit. I believe somebody bought them the wrong blades. What blade do you recomend? I use a lot of Bosch brand blades, but any T-shank blade should work I’ll ask Bosch if they can make a recommendation for your specific application. that is a clean looking cut. wow. I am still debating in my mind whether to get this or if I should throw in another $100 or so to get the JS572E… Probably will be the one jigsaw I own for 10-20 years… Any advice? I still use this jigsaw all the time and love it. This one or the JS572E is a great choice, and you might consider the barrel grip JS572EB as well.